The 86th Infantry Brigade Combat Team (Mountain) ("The Vermont Brigade") is an Army National Guard light infantry brigade headquartered in Vermont and subordinate to the 42nd Infantry Division. It was reorganized from an armored brigade into an Infantry Brigade Combat Team (IBCT) as part of the United States Army's transformation for the 21st century. The 86th IBCT utilizes the Army's Mountain Warfare school, co-located at Ethan Allen Firing Range in Jericho, Vermont, to train in individual military mountaineering skills. This is a capability the army had lost after the 10th Mountain Division inactivated after World War II, except for 3rd Battalion 172nd Infantry Regiment, which has its subordinate units split between Vermont, New Hampshire, and Maine. 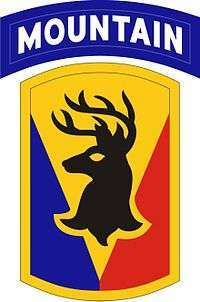 When the 26th Division inactivated in 1993, the 86th Brigade joined the 42nd Infantry Division and was soon to receive M1A2 Abrams main battle tanks. The brigade was deployed with various elements and attachments, to Iraq in 2004–2005 as Task Force Redleg, on a security mission to Kuwait in 2004 as Task Force Green Mountain, redeploying in 2005. The majority of the Brigade landed in Afghanistan in early March. The Brigade Headquarters was based on Bagram Airfield in RC-East. The Brigade was tasked with numerous missions being conducted all over Eastern Afghanistan. The missions included partnering with the Afghan National Security Forces (ANSF), assisting in the Government of the Islamic Republic of Afghanistan, and securing over 30,000 Soldiers on Bagram Airfield while ensuring the base was continuing its daily operations. The Brigade left Afghanistan in early December returning to Camp Atterbury, IN. The Brigade was released from Federal service and returned to the Northeast to continue their respective State missions. A large amount of the Brigade was awarded the Meritorious Unit Commendation for their service from 8 March 2010 – 4 December 2010 for their exceptional performance while deployed in support of Operation Enduring Freedom. ↑ Cunningham, Avery, 172nd Public Affairs Detachment (August 12, 2015). "86th IBCT (MTN) Change of Command Ceremony". Defense Video and Imagery Distribution System (DVIDS). Washington, DC.